Our SharePoint custom web part development services with modern enterpise platforms that enhance business productivity and efficiency to meet your exact business need. With the flexibility of powerful pre-written web parts, web part pages, custom lists and libraries, browser-based editing, FrontPage-based editing, data sources, data views, web part connections, and connectivity to Microsoft Office applications, it's astonishing how much you can do with Microsoft Windows SharePoint Services without programming. Inevitably, however, no tool or set of tools can do everything. With so many efficient coders at your disposal, now would be the time to write some code. In a SharePoint environment, writing one's own code usually means writing web parts. Web parts integrate smoothly with the rest of your SharePoint site, leveraging its existing appearance, organization, security, and data management. What's more, web parts are reusable. It can be written once and can be used in as many pages as you like. 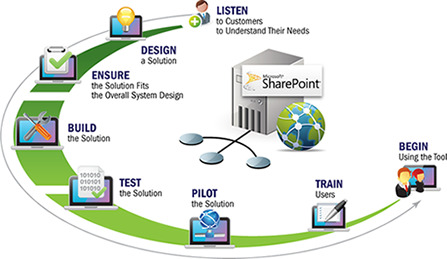 Custom web parts provide an easy and powerful way to extend site features with the help of SharePoint services. It allows you to expand SharePoint beyond out of the box capabilities. You can get new wikis, blogs, taxonomy, and a much slicker user experience across the board using SharePoint Web Parts Customization. Of course, these advantages come at a price. Web parts do not work like ordinary Microsoft ASP.NET pages do, and the traditional ASP pages do not even figure in the same page. Hence, developing and deploying a web part requires a different mind-set and tool-set when compared to developing other kinds of server-based Web components. It is at this point, Enaviya expertise comes handy. Enaviya has a talented team of developers who are capable of delivering improved performance and scalability through compiled customized web parts. With the Enaviya web parts development team, you can be rest assured that your users will be led to the most important information in the easiest possible way.